Recognizes the club that has performed in the highest traditions of Rotary during the previous year. 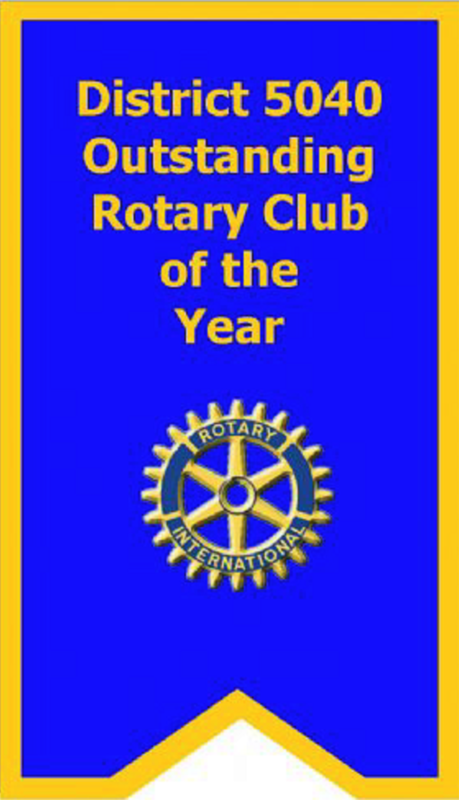 The Outstanding Rotary Club of the Year will demonstrate high achievement as an effective Rotary club. The District 5040 Outstanding Rotary Club of the Year Award is a large cloth banner that the club may display for one year. The banner has the Rotary wheel and the words "District 5040 Outstanding Rotary Club of the Year". The name of the club, the name of the club president and year of presentation will be embroidered on the banner. The award will be presented by the District Governor at the District 5040 annual conference. Each Assistant Governor may nominate one Rotary club. The immediate past governor, district Rotary Foundation chair and district membership chair will be the selection committee. It is mandatory that the club show a net increase in club membership (excluding Honorary members) between July 1st and April 15th of the current Rotary year. Membership increase may include those who have been approved for membership by the club before the year end, but may not have been formally inducted or added to the RI database. Assistant Governors should ensure nomination forms (available on this section of the website) are sent to the Awards Chair no later than 1st April of the current year.